The US economy continues to motor on, fuelled by tax cuts and low unemployment, with this positive story set to be confirmed by the upcoming data. Unemployment could hit a new 50-year low while wages are likely to tick higher as worker shortages continue to bite. In fact, supply bottlenecks are an increasing problem for US companies and are adding to inflation pressures in the economy. In this regard, headline consumer price inflation may hit 2.9% - the highest rate of inflation for more than six years, with the annual rate of core inflation set to rise to 2.3% - well above the Federal Reserve’s 2% target. As such the Fed will continue to hike rates in a “gradual” manner, which essentially implies one move per quarter. Nonetheless, trade protectionism fears linger and could increasingly weigh on sentiment unless a deal can be struck soon. We doubt there will be clarity until after the US mid-term elections in November meaning that uncertainty could lead to a slowdown in hiring and investment in the second half of the year. The trade balance numbers will, therefore, be closely followed to see if the protectionist rhetoric/policies are having much of an effect. There are also several Federal Reserve speakers scheduled who could help shape market expectations for the path of monetary policy. Watch out for the second leg of German hard data for May which will provide more evidence on whether second-quarter growth could come in better-than-expected or whether believers of a more general slowdown get more support. The key data releases next week are inflation figures for Norway due on Tuesday and for Sweden on Thursday are the key data releases next week. We expect headline inflation to move up significantly, to 2.4% in both countries, on the back of higher energy prices. In addition to rising oil prices, electricity prices have risen sharply in Norway and Sweden as low rainfall over the past couple of months means less supply from the hydropower sector. 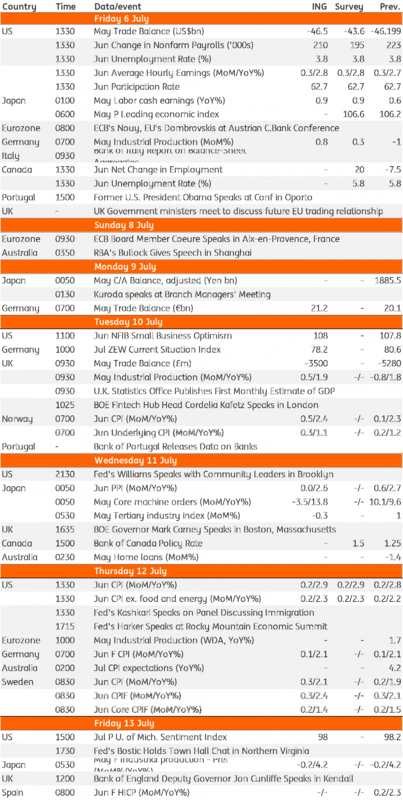 The minutes from the July Riksbank meeting, out on Thursday, are also potentially market-moving. Given the 1.5% appreciation of the Swedish krona after a relatively hawkish message from the Swedish central bank this week, investors will be looking for confirmation of this perceived change of direction in the minutes. On the other hand, a more nuanced tone in the minutes could deliver another surprise (this time to the dovish side).